#DelusionsofCanute' explores man and nature and their roles in placemaking'. As part of 'EA' festival artists were asked to respond to any of the multiple meanings of 'ea' . to be satisfied or avenged. #Delusionsof Canute looks at these meanings in the context of man and nature as designers in placemaking using Auckland's CBD foreshore as their 'playground'. 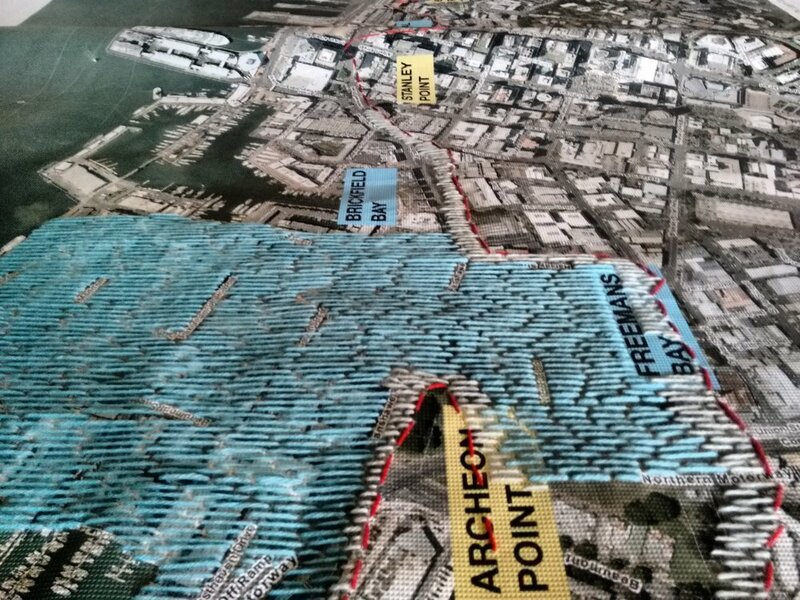 Using Dynamic Characteristics of Auckland Central Business District Reclaimed Zones as a reference point we printed a image of Auckland's current foreshore on builders scrim with the 1840's foreshore marked out in stitch. . People are invited to stitch the sea back the 1840's foreshore. And also the various stories around King Canute (or Cnut) and the tide - consider this an interpretation with a contemporary twist. Originally developed for 'ea Festival' in Auckland, 19 March 2017 and now on-going work.